Hurricane Florence was this year’s biggest storm to date in the US, and the impacts of it were enormous. Physical impacts, as well as economic impacts, have been observed throughout the states affected, with some areas being hit worse than others. The map provides power outage data for North Carolina 6 days after the storm. Counties colored red on the map received the most power outages of any other county in NC, and energy companies needed to scramble to these counties to restore power to the areas hit the worst. These counties in North Carolina, Jones, Craven, and Carteret, sustained a power outage level of nearly 45 percent! Also from the map, you can see that outages were the worst when the area considered is close to the coast. The Coastal Plains of NC clearly sustained heavy damage from this storm. Sustained winds from the storm reached 85 miles per hour near the coast where Florence made landfall. As the storm crept into the Carolina’s just two Fridays ago, it was downgraded to a tropical storm. The speed of the storm slowed and ended up lingering over the Carolina’s for some time, dumping some ~34 inches of rain in coastal areas. In total, there were more than one million people and businesses who lost power, mainly in North Carolina, following the storm. This map was created 6 days after the storm hit, which still shows how severe outages were. The map tracks power usage by individual customers while maintaining privacy of the situation. It allows the public eye, government officials, and on the ground relief workers to gain an understanding of the severity of Florence. 10 Days after the storm there are still close to 10% of customers without power in Pender county, but this is a significant improvement from the map 4 days prior. While there are no counties that show 100% power outages, the map creates a compelling image that explains the viewer to see the extent of which a single storm can have on a coastal area like this. Even counties situated more inland show significant rates of power loss, which puts further strain on emergency and relief agencies. While the county map allows the public eye to gain insight into the impact of Florence, maps like this on the more local scale allow power companies, and relief agencies to target specific areas in most need of aid. 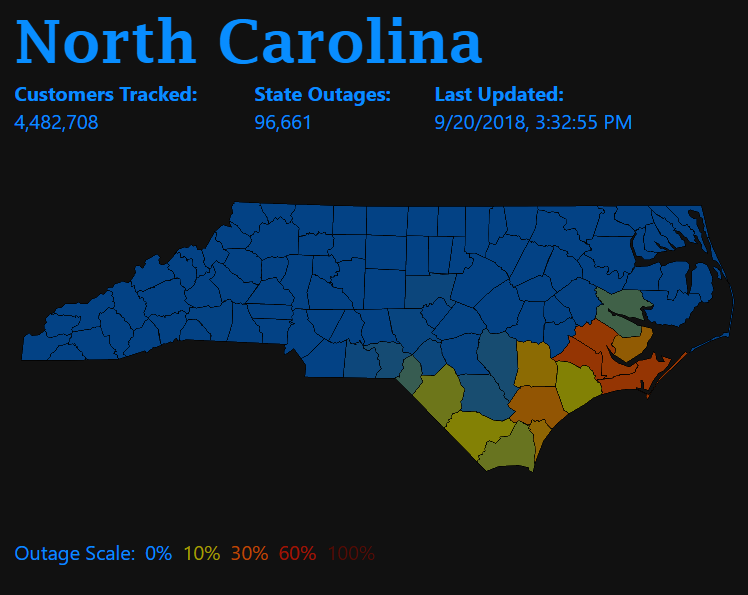 While Florence hit both North and South Carolina, North Carolina had the worst outages. As time goes on, power is coming back to both states thanks to maps like these. 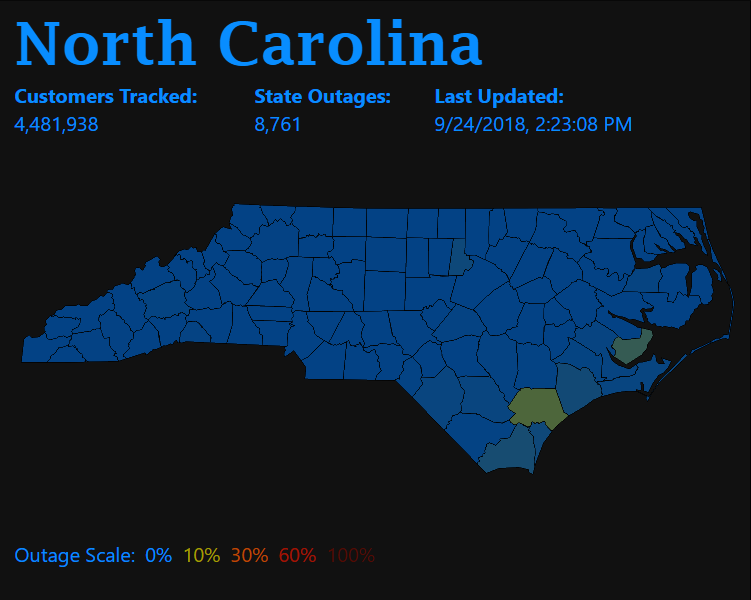 There are still some outages, however, the state of North Carolina is slowly returning to its capacity.